As part of the implementation of Alabama Governor Bentley’s “Accelerate Alabama” Program, the State of Alabama created the Alabama Innovation Fund (AIF) with a 2012 appropriation of $4.0M. The purpose of this fund is to maximize the use of the State’s economic development resources by leveraging annual research and development expenditures by public institutions of higher education to generate high technology resources which can be used to support economic development activities. The AIF supports and operates two distinct programs which is administered by the Alabama Department of Commerce. The “Renewal Program” receives 60% ($2.4M) of the total AIF allocation for the purpose of renewing the high technology infrastructure of the most successful research universities in the State in order to enhance the ability of these research universities to further develop Alabama high technology economic resources. 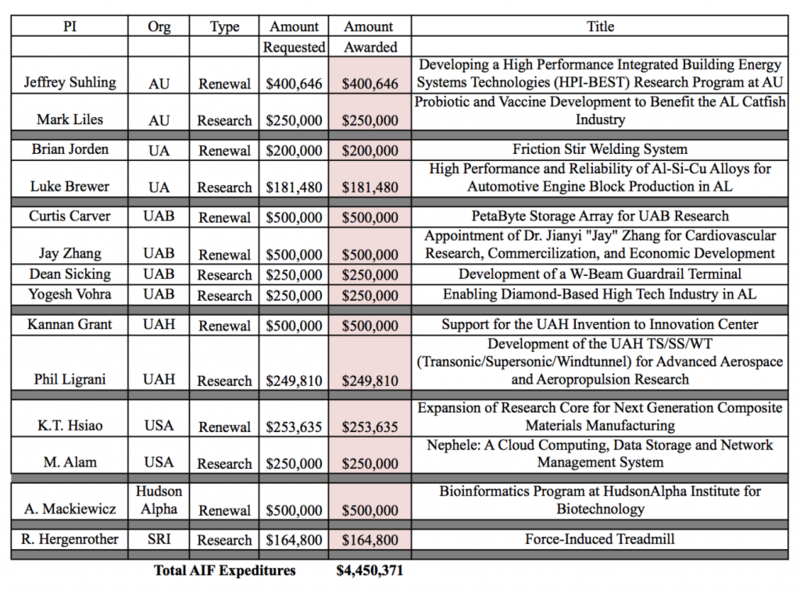 These funds are distributed through grants to each public university which submitted an application with the allocation based on the level of each public university’s total federally financed research and development expenditures for the last three years, with the goal being to provide additional support and economic growth opportunities to those institutions that demonstrated the greatest research success.